Today was a beautiful day, the sun was shining, and the weather was perfect for a little work outside in the garden. I was excited to pick my acorn squash, I have been having trouble growing it the last couple of years, but think I have finally got down the right spacing for this plant. We got three, and there are a couple more on the vine that I am holding out hope for. We love eating these every fall, baked with a little brown sugar and butter. I also picked two of my pumpkins. My fall planting of swiss chard and Kale are doing great, and I thinned them a little today. I also got a bed of Mesclun planted for the fall. I also love how pretty zinnias are in the fall. We had the opportunity to visit a farm stand on the way home from Oktoberfest Saturday, we bought this wonderful corn. It hasn't been the best year for corn around here, because of our colder summer, but this corn was wonderful!! We also bought some delicious Honey Crisp Apples - I wait every year for this variety of apple to be in season. They were so pretty I used them as the background in the new button I am working on. Tonight for dinner we had one of my favorite fall meals- Locally Made Bratwurst (that I brought home from Oktoberfest, check out my Oktoberfest 2011 post) , sauteed in butter along with peeled and sliced apples (honey crisp and gala), and onions sweetened with a bit of maple syrup. Served along side baked yams. This simple and delicious meal is perfect for fall. Peel and core enough apples for your family. Cut the apple slices in half and the onion slices in half, saute in 4 tablespoons of butter, and add a drizzle of maple syrup. When the apples and onions are starting to soften add the bratwurst or any other sausage you prefer- the sausage I used was fully cooked so I just had to heat and brown it, if your sausage is NOT fully cooked you will want to pre-cook it and add it towards the end. Cook until apples and onions are softened, and sausage is fully cooked and warmed. Serve alongside baked yams or sweet potatoes. Yum! Looking forward to the first day of fall tomorrow, as well as my son's 15th birthday this weekend. Having fun getting the house ready for fall decor. Happy Fall everyone! Your meal of Sausage and apples sounds delish! Perfect for an early Autumn day! I haven't harvested my pumpkins or squash yet. Not enough sun to get the fully ripened yet. I have Cinderella pumpkins, acorn squash and Sweet meat ~ a hubbard type squash! The sausage and apple dinner looks great. Nice harvest considering the weather this year. The corn looks delicious...and so does your dinner! 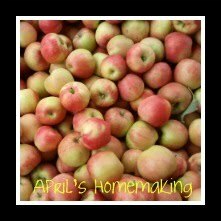 Thanks for linking to Growing Home's Homemaking party! Yum...I can smell it here too! The only thing that could have made that dinner better is some sauerkraut on the side :-). If that doesn't say fall, I don't know what does. Happy birthday to your son! Now that's a perfect example of a fall meal! Yum! You left such a nice comment on my blog and I wanted to reply, but your email address isn't attached to your profile. So I headed over to tell you how much I appreciate you taking the time to comment. this looks so good- I've never done an apple and onion sauté but I know I would like it! Oh boy, at these times I totally wish I could eat through the screen. That looks delicious! Great squash harvest! I hope we have luck with acorn squash like you too. sausage with onion and apple sounds good.